Senior Aaron Greene hopes to bring more compassion to campus through his Growing Together movement. Aaron Greene’s life motto “peace, love and unity” took root on the University of South Carolina’s campus and hasn’t stopped growing yet. His Growing Together movement seeks to ignite a love for humanity in everyone it reaches. The public relations senior came to the university hoping to get out of his comfort zone. He chose to live at the Maxcy International House, which allowed him to bond with students from all over the world. In his freshman year, he got involved on campus by joining the Association of African American Students, Best Buddies and IMPACT. As president of the Association of African American Students, he has seen his plans for making a positive difference at the university blossom. To have a lasting impact, he strived to reach a broader range of students and implement new ideas on campus. Greene took his leadership to the next level and decided to run for student body president. During his campaign, he planted the seed for his Growing Together movement. From that point, the movement flourished on social media and in student support. 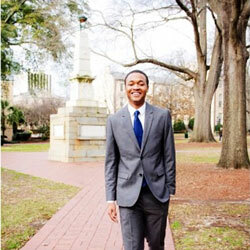 Greene says that going after his goals at Carolina as a minority student is something he doesn’t take lightly, and he hopes his achievements encourage others to reach for their goals as well. One of the most rewarding experiences during his campaign was making an impact on a youth organization that visited campus. Greene could see the kids were excited and inspired by his platform. “I’m highly invested in the welfare of students, and I have a passion for leadership. As a leader, you have to be willing to sacrifice yourself for the betterment of the people, and that’s something I love to do,” he says. Greene didn’t win the election, but he doesn’t regret running because he gained a lot from the experience and support for his movement never wavered. “I don’t think there’s any losing in that, if you run with the right intentions, leave an impact and you inspire people, that’s a win in itself,” Greene says. He used his campaign and new movement to create a documentary, initially so videography and photography students could grow in their craft while helping him. But after filming the campaign, he went on to document close friends and family, even venturing back to his hometown of Orangeburg, S.C. The “Growing Together,” documentary was made in tribute to his brother who died before Greene came to the university. “My brother was my best friend. He always taught me to be a positive light to others and be comfortable with who I am,” Greene says. Viewers get to see a glimpse of how Greene, with much support, turned a tragedy into motivation to reach even higher for his goals and be a positive inspiration to others. Greene plans to continue to make a positive change at the university and help students in any way he can. Greene says he will use this summer to catapult Growing Together to the next level. He has aspirations for the movement to take on many different forms. He hopes to write books, begin motivational speaking and continue to work with young students in his community. He doesn’t want to end by just sharing his story, but hopes to document the stories of many others as well.